WW1 Reenactments Equipment : Great War Tommy WW1 Documents, Paperwork : Booklet Covers - Bombing. WW1 Reproductions and WW1 Reenactors Equipment / Kit - Booklet Covers - Bombing. 2 different manilla card covers only. 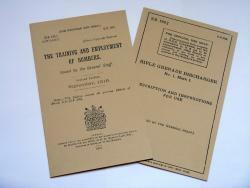 (6"x4" approx') "The Training And Employment of Bombers" revised edition, Sept' 1916 and "Rifle Grenade Discharger No.1, Mk.1" Oct' 1917. Handy as covers for pocket note-books.